The following is republished from the December 2018 edition of the Pennsylvania Observer, the official magazine of the Pennsylvania Licensed Beverage and Tavern Association. Foodborne illness affects about 48 million people every year in the United States, according to the Centers for Disease Control and Prevention (CDC). A large number of these people – roughly 128,000 – will go to the hospital, and 3,000 will die. Not all of this is caused by cross-contamination, and not all is the result of bad kitchen management in a restaurant or bar. But the CDC says foodborne illness outbreaks are more likely to begin at restaurants than a person’s home. Alarmingly, industry statistics show a lack of knowledge on how to prevent cross-contamination. A study published in 2017 that was conducted by the Environmental Health Specialists Network of the CDC indicated many restaurants were not following U.S. Food and Drug Administration Food Code guidance regarding chicken cross-contamination prevention. Many managers lacked basic food safety knowledge about chicken. In fact, 40 percent of managers said that they never, rarely, or only sometimes designate certain cutting boards for raw meat. One-third said they did not wash and rinse surfaces before sanitizing them. And, more than half of the managers surveyed did not know the temperature to which raw chicken needed to be cooked before it would be safe to eat. Charles L. Lowe, MD, a physician with Geisinger Holy Spirit Primary Care in Mechanicsburg, Pa., says it’s a smart idea for taverns and restaurants to do everything possible to keep their patrons safe. So, what should a tavern owner do to make sure patrons don’t experience a night of misery ranging from nausea and stomach cramps to vomiting and diarrhea … or even worse hospitalization or death? Prep and handle each food type with separate pieces of equipment. For example, if you’re using a cutting board to slice raw chicken, don’t use that same board next to slice beef. 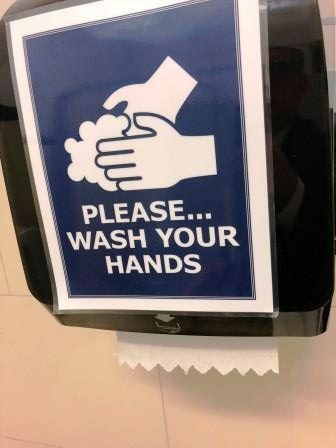 Keep hands clean. Employees need to wash their hands regularly, especially after using a restroom or handling raw meat, poultry, or seafood. That means lathering all parts of their hands up to their elbows with soap, scrubbing for about 20 seconds, and rinsing with warm running water. Use paper towels or hand dryers, not clothing, to dry off hands. It’s tempting to use a shirt or apron to dry hands, but it’s not a good choice. Have a personal hygiene program in place. In addition to proper handwashing, wearing clean clothing every day, use hair restraints, and prohibit jewelry from being worn. You may recall a past ‘Tavern Age’ article in Pennsylvania Observer that covered flu season. Well, personal health is another area of concern. Don’t let employees report to work sick. And, if they have any cuts or surgical wounds, make sure they cover them with appropriate bandaging. Clean, clean, clean! All work surfaces, equipment, and utensils should be sanitized after each use. That goes beyond just rinsing something off.